3 Bedroom End of Terrace House For Sale in Nottingham for Guide Price £135,000. Three bedroom mid terrace property situated in a popular quiet cul-de-sac location. 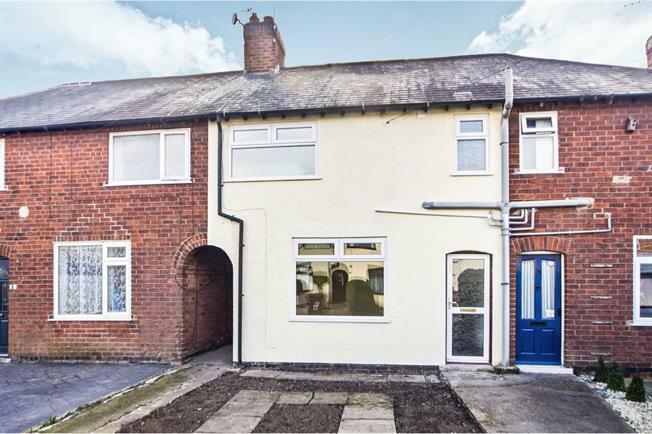 The property has been fully refurbished throughout and is being sold with no upward chain. In brief the accommodation comprises of entrance hall, lounge, open plan kitchen/diner. To the first floor there are three bedrooms and a newly fitted bathroom. To the front of the property is parking for one car with an enclosed garden to the rear. Rolled edge work surface, built-in wall and base units, single sink with drainer, electric oven, gas hob with overhead extractor, plumbing for washing machine, space for free standing fridge/freezer, double glazed uPVC door to the rear, two double glazed uPVC windows facing the rear, radiator, under stairs storage cupboard, wall mounted boiler. Low level WC, panelled bath with shower over the bath, vanity unit with inset sink, double glazed uPVC window facing the front, heated towel rail. Gardens to the front and rear of the property.